So it started in the evening of the 25th August 2006. Seven friends converged at a not so secret location in the northern regions of Southport, England. Our task, to create two teams to descend upon alternative supermarkets and devise a snack pimp. Team A consisting of four people decided upon a Hefty Hip Hop Haribo Heart of Happy Heck (H7) and set off to Asda. Team B consisting of three people legged it out of the door with less clue than a herd of zombie wildebeest. Several ideas were thrown about including a giant cocktail stick whilst passing a garden centre. Upon the instance of the involvement of sugar, we settled to make the Wheely Wicked Whirlygigged Wagon Wheel of Whimsical Wealth (or W7)*. Approx cost: £5.50 with leftovers. Your pimps in this photo are myself (Colin) in the t-shirt sporting an abomination to the eyes and Mark looking slightly concerned. Our third chef does not appear in any of the actual photos, so he can have one of his own. We weren't entirely sure what his plans for the bowl and paper were but can happily report that no one suffered due to them. Backseat cheffing soon changed us to a different recipe which involved adding the eggs and some flower. 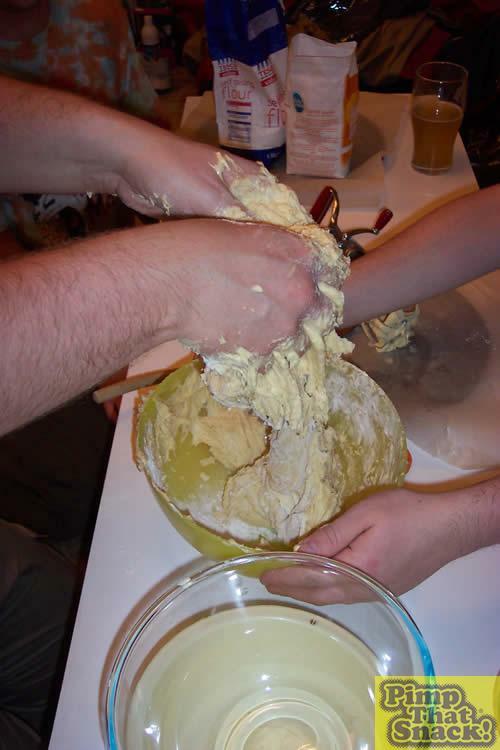 The mix rapidly became too stodgy for the hand mixer so brave Sir Nicholas couldn't wait to get his hands into the moist gooeyness. 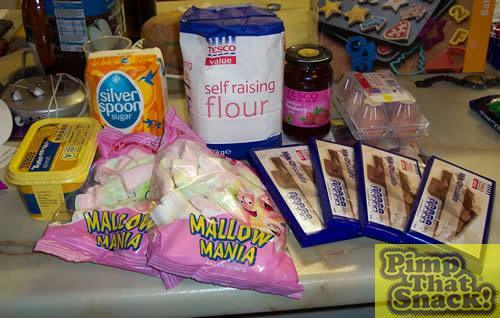 The mixture was built up with more sugar and flour until it resembled a proper dough. 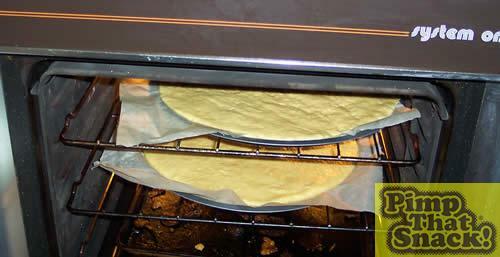 At this point it was divided into two and each part flattened into its own pizza tray covered in baking paper. These then took 40-50 minutes in the oven although they we did swap them over a couple of times to ensure that one was not burning at the top all the time. Et voila, allow to cool. 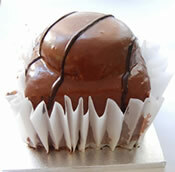 Unfortunately, our photographer appears to having taken a few minutes to go and pleasure themselves on other goodies. We have no evidence of the next stage however we spread jam on one biscuit. The marshmallows were melted on the hob in glass bowls that rested in pans of water so as not to burn. This took quite some time and we found that the two bags were actually far more than enough. At this point, many marshmallows were pilfered as our host switched on a chocolate fondue fountain. Furthermore, anyone entering the house would have received an instant sugar rush just from breathing in.